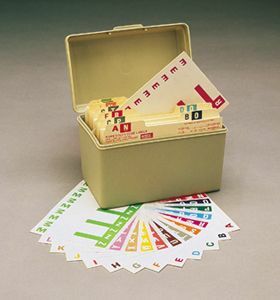 Item# 63-8220 Alpha Z Label Set - pkgs. Alpha Z Label Set - pkgs. Alpha Z Starter Set, pkgs. Smead NCC Alpha Z System. Size 3 1/8" W x 1 5/32" H (after removal of used letter, before folding) A-Z, 1500 labels in a reusable box. Alpha Z NCC color coded name labels code both top and end tab systems. Thirteen colors code all 26 letters. Two letters are assigned to each label, reducing inventory. Tear off unused letter when removing the backing sheet. Use alone for midsized filing systems or with any Alpha Z system. Colors: A&N-red, B&O-dk blue, C&P-green, D&Q-lt blue, E&R-purple, F&S-orange, G&T-gray, H&U-dl brown, I&V-pink, J&W-yellow, K&X-lt brown, L&Y-lavender, M&Z-lt green.